A Gazebo is one the most versitile and unique garden structures you can add to your backyard. Gazebos can be used for a quiet retreat, sitting area, entertaining, focal points, outdoor kitchens, hot tubs, or a home office. As you can see with so many different ways you can use a Gazebo, choosing the right design and size is important. The most common designs are the hexagon (six-sided)and octagon (eight-sided), you will also find them in square and rectangle shapes. The Octagon gazebo is the most popular among all designs for Gazebos. When choosing this shape, consider how you will be using it the most. Going with a smaller octagon shape may limit your use of it. For example a 12 foot octagon will accommodate a seating for six, while a 14 foot, will give the same six-person seating, but with room to spare. Square or Rectangle Design are perfect for a hot tub enclosure or an additional outdoor room to your backyard. If you are hosting parties, events or other large gatherings a square or rectangle design will give you the maximum square footage out of a Gazebo. When choosing materials to construct your gazebo, keep in mind the the architecture features and materials of your home or other visible structure such as a garage or outbuildings. This will help the gazebo blend in with your landscape. 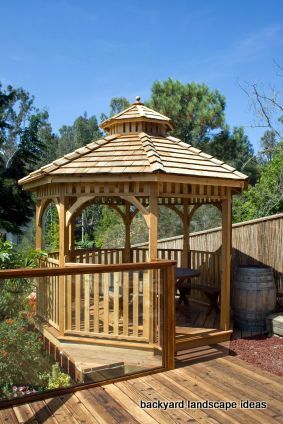 Finished wood is used the most for building a gazebo, if you are wanting a painted or stained gazebo. 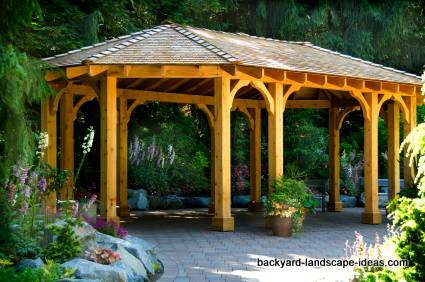 Western Red Cedar is also a common wood used in building gazebos. Red Cedar is known for its beauty, durability and weather resistance. You will also find them constructed from vinyl, canvas, metal, and aluminum. There are endless possibilities when choosing an gazebo style. The two most common are traditional and contemporary. By mixing and matching some different styles you can have a very unique gazebo. Here are some ideas to help you in brainstorming a style you like. For something different design your Gazebo to have a sunken floor. If you plan to use your Gazebo a lot you might want to consider adding some of these to it.